To further protect the Hudson River and lands surrounding it, Scenic Hudson commissioned the first-ever Hudson River Oil Spill Risk Assessment. It provides quantitative and qualitative information on the likelihood of oil spills occurring on the river, and gauges their potential economic, community and environmental impacts. The assessment also takes a comprehensive look at current spill-prevention measures and response preparedness, and offers strategies to improve them. Many factors influence the harm an oil spill can cause to resources vital to the region’s public and environmental health. They include the trajectory of spilled oil, its chemical and physical properties, and when and where a spill occurs. To provide a realistic overview of possible outcomes, the assessment details 77 hypothetical spill scenarios in nine locations along the Hudson. A mapping exercise completed for each scenario—and several varieties of petroleum products—indicates how extensively oil spilled in these locations would contaminate the water, shoreline and atmosphere. This data will prove invaluable for improving spill-prevention measures and emergency preparedness. For example, a Worst Case Discharge (WCD) spill of 6,510,000 gallons of Bakken Crude oil at the Port of Albany occurring in the spring would devastate drinking water intakes, riverfront communities, historic districts, wetlands and aquatic habitats extending all the way to Long Island Sound. Over time, the Hudson River could become a superhighway for transporting even more hazardous petroleum substances. With rising public concern about the use of fossil fuels, Scenic Hudson believes we must fully understand the risks posed by transporting these volatile products on the river in order to enhance existing spill prevention measures and develop new techniques to reduce future risks. 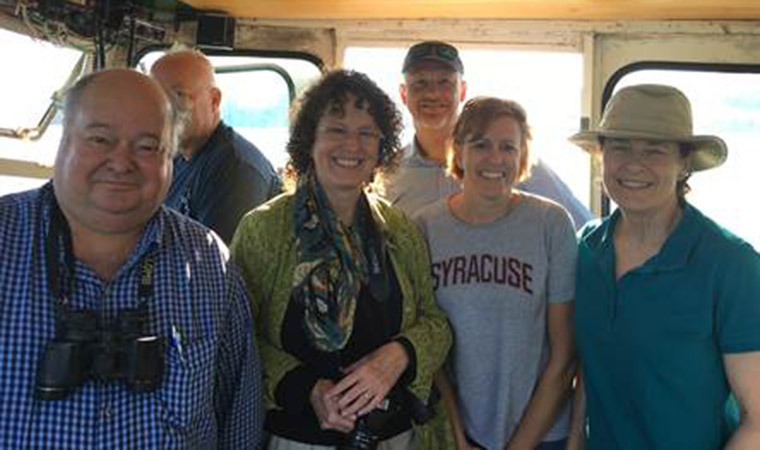 The team that created the Hudson River Oil Spill Risk Assessment was led by Dr. Dagmar Schmidt Etkin (third from left) of Environmental Research Consulting in Cortlandt Manor, and included Dr. Deborah French McCay and Jill Rowe of RPS Ocean Science, John Joeckel of SEAConsult and Dr. Andrew Wolford of Risknology, Inc.